“Outrospectre” is an experimental proposal for a medical device aimed at reconciling people with death through simulating out-of-body experiences. In healthcare the majority of efforts and research focus on keeping people alive. The fear and experience of death is a mostly neglected topic. Recent (para) psychological research, however, suggests that the sensation of drifting outside of one’s own body using virtual reality technology could help reduce death anxiety. “Outrospectre” explores the possible application of these findings in hospital surroundings where it could help terminal patients accept their own mortality with more comfort. This project investigates unanswered questions about mortality and ‘end of life’. “Outrospectre” was generously supported by the AFK (Amsterdam Fund for the Arts) and was developed within the scope of a 3PackageDeal in collaboration with: Waag Society (Creative Care Lab), Makerversity Amsterdam & Museum Vrolik. Frank Kolkman is a dutch-born critical designer, artist and researcher interested in unpicking the socio-economical, ethical and aesthetic implications of current and near-future technologies. His work spans across experimental devices, critical prototypes and interactive installations that address contemporary issues of technological access and adoption. 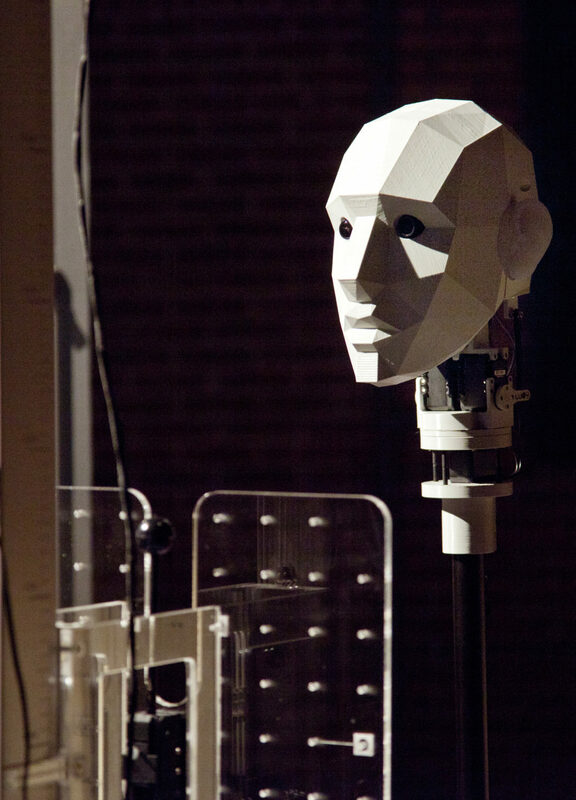 Recent projects include an Out-of-Body simulator, a DIY surgery robot and a domestic drug screening kit. Frank holds a bachelor’s degree in Product Design from ArtEZ institute of the Arts Arnhem as well as a masters degree in Design Interactions from the Royal College of Art. Alongside exhibiting, speaking and teaching internationally he runs an independent design and research studio currently based in Arnhem(NL) – in which he often collaborates with his partner Juuke Schoorl. Juuke Schoorl graduated from the Photography department at the Royal College of Art in The Hague (NL) in 2014. As an artist she explores the borders between the natural and the artificial. By translating these explorations into visually exciting images and film, she attempts to emphasize the sensual qualities inherently present in scientific principles and modern day technology. In trying to surprise her audience, preferably, without the use of digital manipulation her work is usually based on a process of hands-on experimentation. She likes to question the physical capabilities of materials, objects and people in order to transform their appearance. Whereby alienating them from their usual context and challenging our existing concepts of reality. Besides running her own studio from Arnhem(NL) – she often collaborates on projects with her partner Frank Kolkman.